Outlander finally planted its roots in America, but the Starz time-traveling drama hit the pause button on the action to revisit past trauma in a jam-packed season four opener. Sunday’s saw Jamie (Sam Heughan) and Claire (Caitriona Balfe) find both happiness and danger in the colonies as they began their new lives free from political persecution. From saying goodbye to one of their friends who was hanged to helping their future nemesis Stephen Bonnett (Ed Speleers) escape the gallows himself before getting robbed by him, it was an eventful few days for the couple. 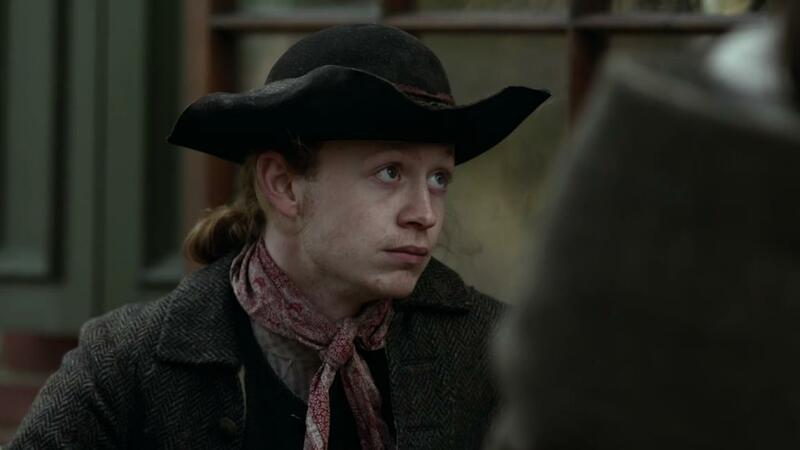 But it was a much quieter moment that stood out as the highlight of the hour as Jamie helped his nephew Young Ian (John Bell) work through the trauma he suffered at the end of season three. While the teen was able to escape from Geillis (Lotte Verbeek) in Jamaica thanks to Claire and Jamie, he didn’t leave the island unscathed. When digging a grave for their fallen friend triggered Ian’s PTSD in the premiere, viewers were reminded that the older woman had raped him at the end of last season. Jamie then guided Young Ian into a makeshift therapy session in which he opened up about his own experience with sexual assault from season one. The uncle and nephew spent a good portion of time having a heart-to-heart about their similar experiences, unpacking both Jamie’s and Ian’s complicated feelings of guilt and shame about the incidents. In a series that constantly subverts assumptions about issues like sexual assault by making men the victims more than women – unlike most period pieces in pop culture – Outlander continues to pave the way for needed conversations. That’s why the producers chose to dedicate a sizable portion of precious premiere airtime to revisiting a scene from last season. “That is definitely one of the most important scenes in the premiere,” executive producer Toni Graphia tells The Hollywood Reporter. “After what happened last year with Young Ian and what he went through with Geillis, being held captive, she’s abusing young boys … Young Ian got caught up in her web and suffers trauma at her hands. We knew that we had to address that this season, just as when we addressed what Jamie went through, his sexual trauma at the end of season one. Great interview!. Yes, poor Young Ian had a horrifying traumatic experience in Season 3 – for a young man to come from a sheltered life in Scotland to that – it’s a wonder he survived it. Claire went through PST as well, with flashbacks to her experiences as a Combat nurse in WW2.